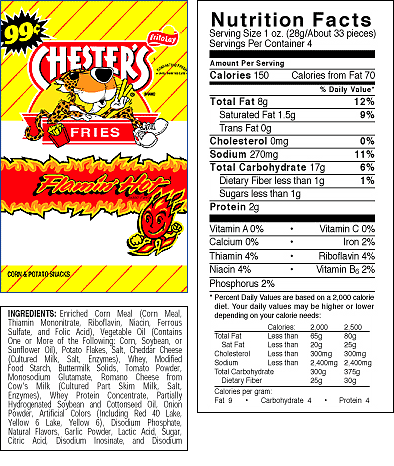 Ingredients: Enriched corn meal (corn meal, ferrous sulfate, niacin, thiamin monoitrate, riboflavin and folic acid) vegetable oil (contains one or more of the following: corn, soybean or sunflower oil), potato flakes, salt, cheddar cheese (milk, cheese cultures, salt, enzymes), whey, modified food starch, buttermilk solids, tomato power, monosodium glutamate, romano cheese from cow's milk (cultured part skim milk, salt, enzymes), whey protein concentrate, partially hydrogenated soybean and cottonseed oil, onion powder, artificial color, disodium phosphate, natural flavors, garlic powder, lactic acid, sugar, citric acid, disodium inosinate and disodium guanylate. 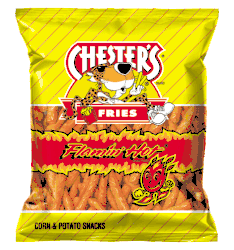 Ten cuidado con las papas Chester's Fries Flamin' Hot hay fuego en esta bolsa! Esta botana es picante - ardientemente picante! Te atreves? �Prep�rate para un chisporroteo de sabor que encendera tu boca! 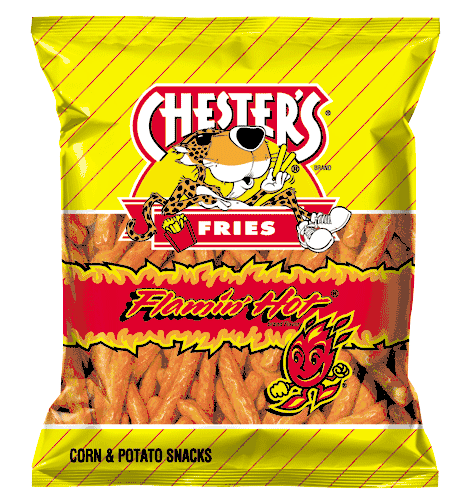 Sumergete en un resplandor crujiente y picante de las papitas Chester's Flamin' Hot. These are the absolute best. I'll get a big bag and then they're gone within a couple days. I know that's probably bad but OMG I cannot stop eating these. the guys love these. they have not been available in our area. glad MEXGROC has them. Best Hot Fries in the world .. THESE ARE THE BEST CHIPS IN TTHE UNIVERESE!!!!!!!!!!!!!!!!!!!!! We can't seem to find these where we live. My girlfriend from Texas loves these, and I do too, and she bugs me all the time to order. They were her favorite snack back home. They always ship very fast and we love them. Thanks.